I’d rather not give attention to an article that is so ridiculous, but since she’s calling out my clients, colleagues, and me, in Forbes no less, I felt the article required a response. The author offers two main premises for her argument: First, if a leader is a good leader, then they don’t need help leading change, and second, that change agents only serve to push someone else’s agenda, which they can’t do without name-dropping and fear mongering. The ‘change agent’ construct is a crock because if the CEO cares so deeply about this project, why can’t he or she manage the leadership team to make it happen? First of all, a recent HBR article stated that Only 8% of Leaders are Good at Both Strategy and Execution, and only 16% were good at either one. Caring about a project is not the only prerequisite to making it happen, nor is trust as the article asserts. Plus, change initiatives are complex projects that require more effort than a single leader can typically do on their own. If you want to give your project a better chance to succeed, you have to: assess the organization to see what needs to happen for everyone affected to adopt the change, help managers at all levels understand and accept their part in leading change, root out resistance and work with people to address their concerns, develop customized communications, ensure the structure, culture, and systems all support and don’t obstruct the change, determine how to equip, enable, and engage people to change and implement it. It can be difficult for an experienced change agent to do all that, let alone a leader with other responsibilities. There is no problem getting people to change if they support the changes… The only changes people resist are the ones they feel are stupid. People can still resist change even if they don’t think it’s stupid. 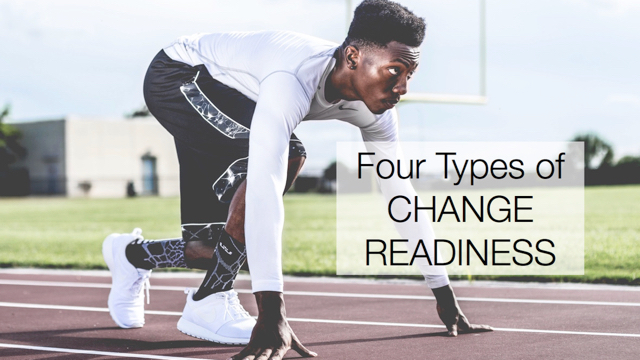 Even if a change makes sense, there may still be fear, a sense of loss, or competency gaps, for example, that prevent people from adopting change. Getting them to support change is the hard part, and takes more than leadership. Too many self-described Change Agents don’t realize that they are enablers for a CEO’s poor leadership. On the contrary, the change agents I know are champions and coaches of good leadership! Many in leadership positions don’t naturally know how to lead change. Change agents are not crutches or go-betweens. We need leaders to lead in order for change to be successful, and we’re only effective when we help them do so. On the point about change agents pushing agendas through fear, she tells the story of a conversation with one change agent who, when asked how he gets managers on board with his project, responded that he drops the CEO’s name and implies a threat if they don’t comply. If that’s the definition of a change agent she’s using, then she’s right! She’s describing someone who does not know there are 98 other ways to influence people than relying on the authority of others to push it through. If this is your approach to change and you call yourself a change agent, please stop! You’re giving the rest of us a bad name and causing angst in your organization. In the article, Ms. Ryan also denigrates change agents for pushing someone else’s agenda. The change agents I know aren’t trying to sell a predetermined solution. They work within organizations to find solutions that will achieve the desired results. Often that includes pushing back against leaders’ agendas when they’re misguided, or when they hurt the organization. Balancing in the space between meeting leaders’ expectations and standing up for the people who are going through change requires candor and courage. Change agents – the good ones, at least – do the opposite of what Ms. Ryan describes. We strive to make sure people do not become victims of change and seek to increase morale through engagement and by building trust. Leaders can rely on our expertise to help them lead change, and it’s a mark of wisdom, not weakness, when they do. Thank you for sharing this! I’ve forwarded a link to your post to several of the Change Management groups that I am a member. Maybe someone could write Forbes an article to counter her original post? That is crazy. I follow Liz Ryan on LinkedIn.. I’d be happy to write an article correcting this stuff.. I am equally shocked by her article as by Forbes publishing it, especially that is presumptuous and ignores all the leadership data available to us these days. Thank you Heather for your factual reply! Shocking – successful projects all have Change Agents. As being one of the few living 100 original change agents, I believe that I am an expert to comment on this article. This article reflexs the state of change management in the world today but clearly gives no clue about what a real authentic change agent is or what a competent change agent is and should become. The field of change would do well to hear seriously the feedback in this article and together collectively & positively make the change in our profession that does not create this kind of cynicism. Tim and Scott , my heroes from Prosci are you listening! And I cannot agree more with what paul has said. He has nailed it. I believe we now need whole system transformation starting by helping the CEO transform him or herself in context of transforming the whole system. It has to start at the top. And then I believe all the wonderful change management work that’s going on today will not be resisted but will be sought. In any case it’s all going to work out. May each of us do the best to change ourselves and every room that we enter towards a more positive future! In John, I totally agree with you I always start at the top. I have a fail proff transformational change process to transform the top team that I have not changed since 1978. What I have changed is how the top transforms the rest of the system. Leadership development must be integrated with cultural change and improvement… all while connectedconnected to the strategic plan & business goals. I don’t expect she will like this but here is the comment I made re the article. . .
Everyone knows agents facilitate because they can bring to the table expertise that is not available in-house, otherwise why would corporations hire them? Certainly the article is over the top, but the point is valid. Transformation must be driven by a committed and charismatic CEO who is able to build loyalty and trust in the organization. This can’t be delegated. That said, of course there is a role for skilled development professionals that bring tools and experience to augment the leadership of the CEO and his/her team. But without versatile (i.e. both tough and relational) leadership from the top, transformation won’t happen. The problem here lies on both sides of the argument since both seem focus on the synptoms and not the malady itself. Change, in order to be sucessful (i.e., sustainable), must be self-made but it does need –just to get started– an outside facilitator who knows about organizational design principles and the sound/sustainable alternative to the restrictive (i.e., buraucratic) organizational structure. So glad you’re bringing this our attention. I don’t know Liz Ryan but several people in the LinkedIn community identified her as a ghostwriter for a mole. Her writing campaign created the GenXYZ tension that led to a lot of nonsense at the workplace. Her writing is getting worst and more irresponsible. Besides, the one situation that is the basis for her article seems like a project that didn’t hire a real ‘Change Agent’ with a real change process. The entire process and this person was a stopgap to prevent a mutiny. Not a good way to go about change, very little trust, lots of collateral damage. Don’t fret…this is just Liz Ryan at it again…Someone should ask her who she wrote this for…. The counterpoint is aptly worded. This is like saying a good leader is someone who knows how to develop his people so why do you need leadership development teams or l&D teams or that a good leader should know how to strategize and execute his strategy so why bother with corporate strategy or strategy consulting organizations. While it is true that in most small or startup firms leaders do all of this themselves, these support structures are required when the organizations grow larger , wider & diverse..
Talk is cheap an easy. The hardest part is to back up what you say. I will ask Liz how she reached those conclusions about Change Agents. It is good to express disagreement as long as is backed up with some evidence. Any successful experience deploying Change supporting what is fitly said here? I am interested . I don’t know if it “is a hoax and a scam” but if “a Change Agent is assigned to move a big corporate or institutional project forward” it is precisely part of the reason why so many Change/ Business Transformation projects are wrongly deployed. Evidently the Mcdonalization of OCM (So many CM Training Institutions/CM Fraternities offering on line OCM certificates) has not worked at all and has just commoditized the OCM field. Fortunately what happened to Accenture (above) is a warning for any other Pretenders that don’t deliver/address customer requirements and are just clouds and winds without rain.. Since I doubt you’re eager to return to Ms. Ryan’s article, I wanted to share the comment I posted to her article after reading it. Kudos for speaking up and out and keep your post above circulating over the next few months so a balance of voices is heard over just one angry one! “Liz, I think I understand your intent in this article – a real change agent isn’t simply a henchman, trust is paramount to being able to cultivate change in an organization, and CEOs have a crucial role to play in this process. That’s my paraphrasing of your comments. Having said that, this is an irresponsible article at worst and an angry rant at best. I almost got a “dear diary” sense from reading this, as if you’d encountered one too many organizations in transition that had ‘heavies’ at the top who were put in place to do the dirty work of a difficult change. That’s the best case scenario. At worst, what you’re saying is that all by his or her lonesome, a CEO who has cultivated great trust in their teams and has a great strategic idea that will call for a great deal of change throughout the organization can be successful in moving that change vision to reality. That’s plainly an irrational statement that overstates the role of a CEO and oversimplifies the process of getting a group of people to move in a new direction…TOGETHER. get better at that aspect of helping leaders and organizations navigating change. Part of the huge problem I see with your opinion piece is that you only and associate the term Change Agent with the worst possible manifestation of that term – the henchman. And believe me, I empathize with what you describe. It took me several months to realize that I’d been hired to do what my boss didn’t want to do – because it was too challenging, would likely make me unpopular, and involved super, super difficult personalities. And in various transformation programs over the years, I’ve often had to step in where leaders are clearly unprepared for having those difficult conversations with employees about potential layoffs or cost-saving measures. But more often than not, I’ve been a facilitator of positive progress in large organizations where it would be quite literally impossible for one person at the top, no matter how powerful (by position) or influential (through trust) a CEO s/he might be, to make the change happen all by themselves. Thanks for your thoughtful counterpoint. I, too, reached out to Liz Ryan to offer guidance on how she might reframe her points in a follow-up, and to Tim at Prosci to publish a Prosci POV, in response. Today I reposted on LinkedIn an HBR article on 4 Things Change Leaders do Well. It focuses on the complexity of Transformation initiatives, and that organizational leaders need to embrace. The article highlights how challenging these realities can be for even excellent, experienced leaders, and therefore begs the questions: “how do we develop, guide and coach change leadership skills?,” and “who does all the design, planning and implementation monitoring and guidance?” These are key roles of change agents – external or internal consultants whose skills and competencies complement those of leadership. Ryan’s article was provocative and decently well-written, which are the only two reasons that Forbes published it…. Your reply is a much better illustration of reality, and well written also. Thanks for sharing.